In Part 1, I talked about the importance of small nonprofits managing their finances as if they were for-profit and using some or all surpluses to build an endowment fund, if they are to survive what appears to be the beginnings of a long-term trend in “under-funding” (100% to mission, 0% to administration). Profitability, however, is no easy feat if your organization is small (whether you’re a for-profit or a non-profit). I was struck by a recent statistic claiming that of the 28 million for-profits tracked by the Small Business Administration in 2013, only 6 million (21%) were actually profitable. Only 21%!! As difficult as it is to be profitable if you’re small, many large nonprofits do a phenomenal job at it. Consider my wife’s alma mater Columbia University (CU) here in New York City. CU posted an operating profit of over $230 million in its most recent filing (period ended June 30, 2014) on gross revenues of $3.8 billion. The market value of Columbia’s endowment funds now exceed $9 billion, which generated nearly $350 million in unrestricted income. In keeping with one of its nonprofit missions, CU awarded just over $200 million of non-government University money in financial aid grants to deserving students with great potential, but who were unable to afford the tuition (current needs). And most telling for the purposes of this blog post, CU transferred $17.4 million of its 2014 operating surplus back to its endowment funds (future needs). Way to go Columbia! Clearly, many large nonprofits know how to make a profit, so I’m not worried about them. But I do worry for the hundreds of small nonprofits with wonderful causes that make our communities so much better, yet struggle month to month. That’s why you should really pay attention to how the large tax-exempts do it. If you dig into their financials, you’ll notice their “for-profit mentality” at work: robust fundraising departments to drive current (and future) revenue; continuous expansion of their endowment funds for future revenue; and an unrelenting focus on cutting expenses wherever possible. If you are a small struggling nonprofit, perhaps you should emulate the large ones — drop that nonprofit “deficit mentality” and really strive to be profitable. Good luck, and thank you for making our world a better place! New York governor Andrew Cuomo recently signed into law the “Non-Profit Revitalization Act,” which totally overhauls our State’s antiquated nonprofit regulations. Most of the reforms will go into effect July 1st of this year. Applauded by many, the new provisions will eliminate unnecessary and outdated bureaucratic burdens. More importantly, the Act should reduce some of the fraud prevalent in the industry (see my blog post dated 01-21-2014). However, one thing that the Act did not do, is to reduce the personal liability that non-profit Board directors take on in New York for their philanthropic service. Quite the contrary, not only does the Revitalization Act place all the responsibility on Board directors to carry out the stricter provisions, but it also grants the Attorney General sweeping new powers to prosecute them for negligence and even incompetence. Although the intention to crush fraud is laudable, I believe it will cause some un-intended consequences. Keep in mind that unlike the for-profit world where most Board members are experts in their fields (such as risk management, audit, finance, legal, etc. — and are compensated for that expertise), Board directors for tax-exempt organizations (TEOs) are mostly un-paid volunteers who care about doing good. This is not to say that TEO board members do not have any expertise in corporate governance (many do). However, the culture at many TEOs is more easy-going and casual, the type that focuses on social benefits such as how many trees were planted, how many scholarships were awarded or how many whales were saved — and not on designing and administering a whistleblower policy, for example, that includes procedures for the reporting and handling of suspected violations of law. Does the average volunteer director even have the expertise for this type of work? In many ways, non-profit directors are at much greater risk for personal liability than for-profit Boards because the volunteers have at their disposal smaller budgets and staffs, and worse yet, limited access to experts such as lawyers and accountants. The Revitalization Act puts the volunteers’ existing personal liability on steroids. Consequently, some volunteer directors may choose to resign to avoid the additional burdens and risks being placed on them. After all, they can continue to do good by simply donating money to their favorite causes, but without any of the personal liability. So what can you do if you’re the Executive Director or the Board Chair to prevent resignations? Start with a careful and thorough review of your Director and Officer (D&O) liability insurance policy. Since there is no such thing as a “standard” D&O policy, you should hire an expert (usually “fee-only” insurance consultants) to help you. Be sure to have your Board participate in the discussions, so that their concerns are heard and acted upon. At the very least you want to know if your aggregate coverage limit is still adequate considering the new law; whether certain sneaky exclusions (such as “failure to provide insurance”) can be removed; whether the cost of legal representation falls in or out of the aggregate coverage limit; and whether the policy offers “tail” (or extended reporting period) coverage. Based upon your Board’s reaction, you may have to change underwriters. You also want to determine whether to hire a consultant to train two key volunteers on your team: the Chair of the Finance Committee (i.e., the Treasurer) and the Chair of the Audit Committee. Ask them if they want/need a training or refresher course on their duties. Among their many responsibilities (and depending on the size of the non-profit), the Treasurer should be reconciling the organization’s bank accounts monthly, insuring that month-end cash balances are correct, and reviewing/co-signing all out-going checks above a certain amount. And the Audit Committee should be double-checking that work on a quarterly basis. Although the Revitalization Act does not specifically require that each tax-exempt organization have an Audit committee, you should have one. However, if your non-profit is too small to have both a Finance and an Audit committee, don’t be tempted to merge both functions into one “Finance and Audit Committee” for the sake of expediency. That’s because one of the primary duties of the Audit Committee is to carefully examine the Treasurer’s work. And it has to be able to do that independently of the Treasurer. If an Audit committee is not feasible, then the responsibility falls on the entire Board of Directors to evaluate and approve/disapprove the Finance committee’s output. When directors realize that the Revitalization Act makes them even more financially and criminally liable for this work, you may find that some of them may want additional training. Give it to them! Hopefully, if you respond proactively to the new legal landscape, you should be able to keep all your directors. Good luck! I recently completed a professional certification at New York University in Non-Profit Accounting & Government Reporting, and the subject that troubled me the most is the rising incidence of fraud at tax-exempt organizations (TEOs). Since 2008, most nonprofits are required to file the new revised IRS Form 990 and disclose any “significant diversions” of their assets. By significant, the Internal Revenue Service means losses of $250,000 or more suffered by the tax-exempt as a result of theft, fraud or embezzlement. Analysis of this new IRS data reveals that the number (and dollar amounts) of reported diversions is huge, especially here in New York. This was brought to light a couple of months ago by Joe Stephens and Mary Pat Flaherty at the Washington Post after an extensive review of thousands of non-profit filings from 2008 through 2012. (You can read the full story here.) They found that TEOs have been scammed out of hundreds of millions of dollars. And we’re not talking about small, under-staffed TEOs. The victims range from AARP ($250,000 embezzlement) to the Maryland Legal Aid Bureau ($2.5 million). Here in New York, the victims range from well-known hospitals such as Vassar Brothers Medical Center in Poughkeepsie ($8.6 million) to such venerable Ivy-League institutions as Columbia University ($5.2 million). However, one significant diversion in New York that you will not yet find in a public Form 990 because it is so recent is the case of the Metropolitan Council on Jewish Poverty. Just a few months ago, the Board of Directors of the Met Council (as it is commonly known here in New York) received an anonymous letter alleging an insurance kickback conspiracy between its CEO William Rapfogel and its insurance broker, Century Coverage Corporation. Apparently, Century was inflating the premiums on the insurance plans it sold the Met Council, to the tune of $5 million. Supposedly, the CEO was kicked backed over $1 million in cash, with his co-conspirators getting the remaining $4 million. Allegedly, some of that $4 million was then funneled back to City and State politicians who had steered government grants to the Met Council. For those of you not familiar with the non-profit industry in New York City, the Met Council was one of the most venerable and respected social service groups in the Jewish community, with an annual operating budget of approximately $27 million (according to the most recent Form 990 publicly available, which is for year ended 6-30-2011). Nearly $12 million of the Council’s expenses that year were financed with state and local government grants (in other words, with your taxpayer money). According to the New York Times, long-time CEO William Rapfogel was so respected in the Jewish community that he was sometimes referred to as “the prince of the Jews”. He was also extremely influential in City and State government circles. He was close, personal friends with the powerful Speaker of the New York State Assembly, Mr. Sheldon Silver, and with many other lawmakers whose friendship he cultivated over the years, and who have directly or indirectly steered millions in City and State grants to the Met Council. By the way, the owner of insurance broker Century Coverage (a prominent Breslov Hasidim by the name of Joseph Ross) pleaded guilty shortly after his arrest in November. He is said to be cooperating fully with the authorities in the hopes for leniency. Both the current Met Council CEO (William Rapfogel) and the former CEO from 1989 to 1992 (Rabbi David Cohen) were arrested, as was the former CFO from 1991 to 2009 (Herbert Friedman) on a long list of charges including grand larceny, money laundering, criminal tax fraud, conspiracy and falsifying business records. It seems that the scam has been in place since the early 1990’s! Upon discovery of the embezzlement, the Board acted correctly in firing Mr. Rapfogel and informing the authorities. It should come as no surprise to you that government regulators temporarily froze millions in grants and contracts that had already been approved for the Met Council, pending an investigation. But what should surprise you was how quickly the charity was cleared of any wrongdoing (in less than 60 days). Even more surprising was that the State required only a few basic reforms of the non-profit, such as putting in place a code of ethics, and policies for conflicts of interest and anti-nepotism. Also, it’s to appoint 2 new independent directors and submit to monitoring of its compliance by an outside inspector general. That’s it…?! You might be wondering how could such a large tax-exempt organization not have a code of ethics, or policies to deal with conflicts of interest and anti-nepotism in the first place? And more importantly, would these reforms have even prevented the fraud? Equally troubling to me is the fact that the scam was only discovered thanks to an anonymous letter — and not through the Met Council’s auditors or the Board’s audit committee or any government oversight. It’s in these failures by the auditors, the Board and the government agencies that awarded the grants where the real problems lay, not in some deficient code of ethics. In my opinion, the State should have fired the auditors and all the Met Council’s senior accounting & finance leadership, as well as replaced the entire Board of Directors. In addition, it should have appointed an independent inspector general to investigate and reform its own State agencies that awarded these grants without the proper oversight. Only then are you truly starting to address the problems. I’ve been consulting for more nonprofits lately, and I’m finding that they tend to make the same basic mistakes when it comes to managing the business side of doing good. Because of their very nature (usually a lot of their funding comes from well-meaning donations that are specifically restricted for programs, but not overhead), nonprofits typically keep administration, accounting and compliance expenses to an absolute minimum — not realizing until it’s too late that this could be a fatal mistake. As laudable as their program missions might be, nonprofits should not under-budget these often-neglected, non-programmatic departments. 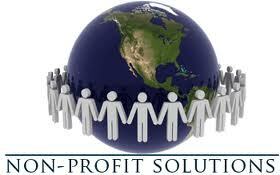 Take the case of U.S. non-profit organizations (NPO’s) doing good in Latin America. Many of them have never even heard of the Foreign Corrupt Practices Act (FCPA), much less set up robust compliance departments to help them navigate the treacherous waters of operating down there. Yet U.S. nonprofits are very much subject to this law, just like regular for-profit companies. Local staff or agents. Many nonprofits hire individuals or organizations (often local nonprofits) to carry out their work and act as their agents. As with for-profit organizations, such local hires present heightened FCPA risk and should undergo due diligence. In addition, nonprofits should be alert to corrupt or fraudulent practices from local nonprofits, such as attempts to fund administrative costs by requiring kickbacks from contractors hired to do specific projects. Accounting provisions. Because nonprofits are not “Issuers”, they are not subject to the accounting requirements of the FCPA. Nevertheless, they are well advised to have accounting controls similar to those required of Issuers under the FCPA. Internal controls significantly reduce the risk that an employee or agent of the nonprofit will violate the FCPA’s anti-bribery provisions. Perhaps more importantly, such controls also reduce the risk that nonprofits will be a victim of corruption or embezzlement. In conclusion, if you are a U.S.-based nonprofit with operations in Latin America, your senior management and Board of Directors should pay close attention to the organization’s FCPA compliance. As you can see, there are several important issues that an NPO must keep an eye on to avoid problems down the road. If you’re wondering how you’re going to pay for a compliance department (or even just 1 compliance professional or outside consultant, given the preponderance of restricted donations), you should consider modifying your fundraising plan to seek specific support for compliance-related matters. The support could be in the form of grants, of course, but don’t overlook valuable pro-bono training and/or legal advice. Who are possible donors, you might ask? Consider calling on larger NPO’s with global operations, international foundations, multinational corporations with large FCPA departments and, especially, U.S.-based international law firms with FCPA experience. Another possible group of potential donors are multinational firms that have run afoul of FCPA regulations that resulted in severe sanctions. There are many companies that fall under this category (Ralph Lauren Corp., BizJet International, Siemens, Ball Corp., SNC-Lavalin, Helmerich & Payne, Chiquita Brands, Stryker Corp. and Walmart just to name a few). As these firms re-structure to comply with the terms of their government settlements (which usually include MAJOR personnel & procedural changes), these sanctioned companies might be open to the idea of sponsoring the compliance department of a nonprofit like yours, in a contrite attempt to clean up their tarnished images. It would be good PR for them and a great source of funding for you! I hope all of you had a wonderful and safe summer vacation! 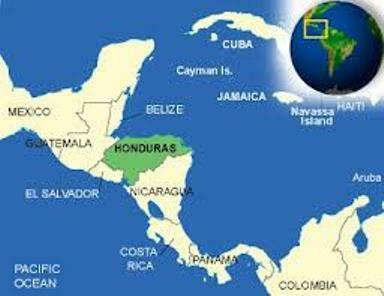 You might remember that in Part 2 of my blog series “Want to Invest in Honduras? 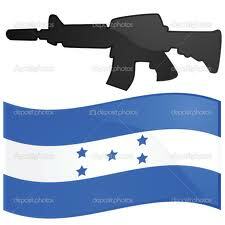 (The Reality)”, I wrote about why I’ve come to the conclusion that Honduras is practically at war for its very sovereignty. And I believe few foreign investors are actually aware of what’s going on in this country; of who the warring factions are; and — if you are already doing business down there — of what your financial AND legal liabilities might be. Part 3 — The Drug Kingpin Act. If you are an American doing business in Honduras, your risks are far more than just financial. 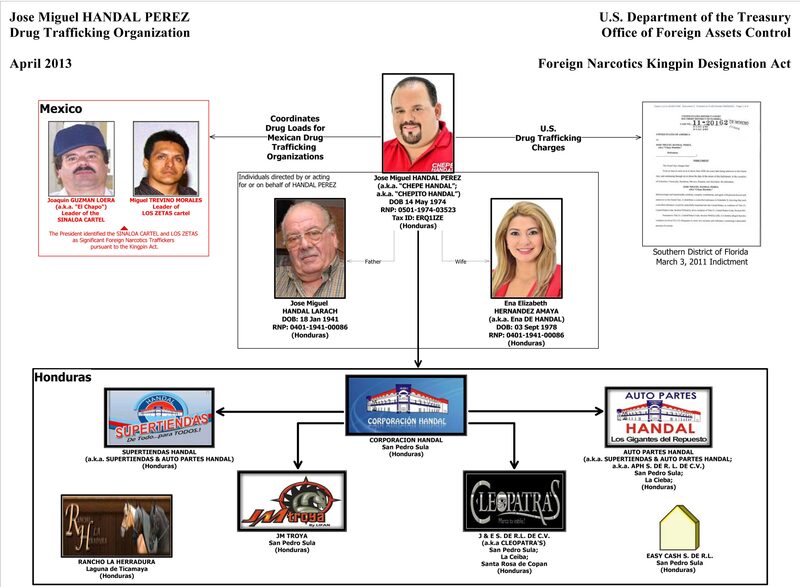 There is this law called the Foreign Narcotics Kingpin Designation Act (FNKDA) that makes it a crime for Americans to engage in “any transaction” with persons designated as drug kingpins. In addition to the monetary penalties, violations of the Kingpin Act could include up to 30 years in jail. According to the State Department, between 70% and 90% of all cocaine destined for the United States goes through clandestine re-fueling landing fields in Honduras. If accurate, that’s the equivalent of tens of billions of dollars every year! You must therefore take the drug trafficking and money laundering issues in Honduras quite seriously, and do your background investigations and due diligence carefully. This should include following up on all credible local rumors about the person(s) with whom you are considering doing business. The problem in a country as small and as corrupt as Honduras is that most everybody (who is anybody, and with whom you would naturally want to do business) is rumored to be directly or indirectly involved, especially in money laundering. And I mean the rumors go to the highest level of society, business and government. Even the president of the nation is rumored to be deeply involved, with the help of his brother in the state of Olancho. Of course, not all rumors are credible or true. But you as an American investor who’s subject to the Kingpin Act have to carefully document the results of your due diligence. This can get complicated and expensive; yet it’s unclear how effective it would be in keeping you out of trouble. Consider, for example, the following hypothetical situation: let’s say that your background investigations and due diligence clears the owner of a beautiful, modern office building in the capital city of Tegucigalpa where you are considering a 10-year lease for a large call center. You sign the deal, build out your space but 3 years into the lease the U.S. government designates your landlord as a drug kingpin. Are you in violation of FNKDA? After all, you are now officially engaging in a business transaction with a drug kingpin (and will be doing so continuously), through your monthly lease payments. Does your carefully-crafted due diligence documentation clear you of any wrongdoing? If so, can you legally continue with the 7 years left in your lease? If FNKDA forbids you from continuing your lease, how do you unwind your massive investment? How much time do you have to unwind? What’s your recourse for the losses? The building may or may not be seized by Honduran officials, but they would be doing you a favor if they do because you are now technically in business with the Honduran government, and not a drug kingpin. However, longer term, do you really want the Honduran government as your landlord for the next 7 years…? Click on the images, and you will see a good size network of legitimate businesses, any one of whom could be your client, your supplier or your landlord. Please note that the lists are not complete, not by a long shot. 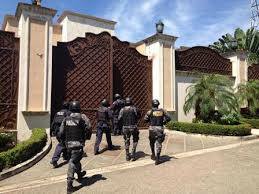 In the case of the most recent designation (the alleged Drug Cartel ‘Los Cachiros’), the Treasury Department estimates the total value of their assets to be somewhere between US $400 million and US $600 million, including vast holdings in real estate and hotels. The seizures are just beginning. If you happen to be doing business with any one of these companies, you obviously have to stop as quickly as possible and retain competent legal counsel. Speaking of counsel, please note that even before the Kingpin Act was signed into law by President Clinton in 1999, the National Association of Criminal Defense Lawyers (NACDL) in Washington, D.C. did not like the new law. 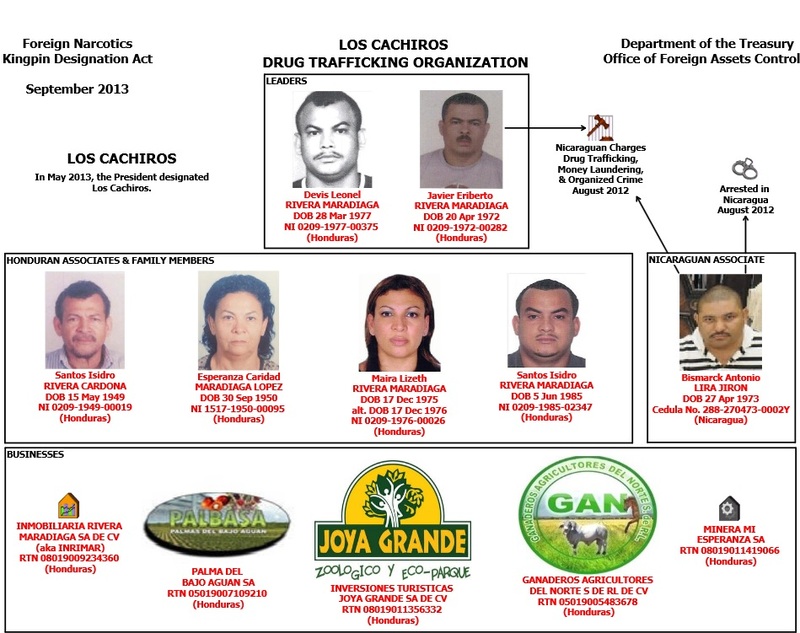 See the complete text here ( http://nacdl.org/Advocacy.aspx?id=11558&terms=foreign+narcotics+kingpin ). You might be wondering how this designation list (or “black list” according to NACDL) is generated. Well, it starts at the Treasury Department’s Office of Foreign Assets Control (OFAC). Using all available intel, OFAC tabulates a gross list of suspects, which it then circulates among several government agencies, including the DEA, FBI, CIA, Homeland Security and Department of State. If any one of these agencies, for their own strategic reasons, objects to the publication of a particular name, it is removed. The names that remain before June 1 are sent to the White House for final deliberation. The vetting of this list is an annual process. You may now be wondering what a “strategic” reason might be for objecting to the publication of a particular suspect. I guess that if you’re the CIA and you see one of your key informants on the preliminary list, you may want to protect your source. In my hypothetical scenario described above, the owner of that beautiful modern office building in Tegucigalpa may actually be a drug trafficker and/or money launderer — but for right now, the CIA values his/her information enough to veto their inclusion in the infamous list, at least until next year. As you may have already surmised, doing business south of the border is NOT a simple extension of doing business in the U.S. If you’re going to invest in Honduras, please do so with your eyes wide open. Don’t assume anything about anybody; do your background investigations and due diligence with earnest; and have a very good personal security plan (and team) in place. Good luck! In Part 1 (The Sales Pitch), I wrote about the many features that in theory make San Pedro Sula, Honduras a desirable Business Process Outsourcing (BPO) destination for small manufacturers and BPO providers. Except when you look into the issues of crime, violence and general insecurity. One BPO sales team explained it away as mere petty street crime and gang fights over territory. However, my findings tell a much different story. Part 2 — The Reality…2012 was a Record Year for Murders in Honduras, and they are not solely gang-related. When I visited Honduras recently, many people were still talking about the circumstances surrounding the murder of the former Police Chief’s son. You see, earlier this year several masked gunmen murdered his 17-year old son (execution style) alongside his 2 bodyguards in a trendy restaurant. The former Police Chief, who was fired in May 2012 over two high profile murders that happened during his watch (that of the country’s deputy drug czar and of a renowned investigative journalist), angrily claimed that it was the new chief of police who ordered the hit against his son, and that the execution was carried out by police officers. After such incendiary accusations, he was forced to flee the country and, according to family members interviewed by a local newspaper, he is now hiding in the United States. It is worth noting that the former Chief’s allegations regarding his replacement are not out of the realm of possibility. The rumors are that the substitute has been involved in a number of murders, allegedly carried out by death squads under his command. Although the new Chief was exonerated of one of the murders that went to trial, the Obama administration felt there was enough compelling evidence to temporarily freeze all security aid to Honduras in August of last year for a policy re-assessment. Just a few days after my arrival in San Pedro Sula, the topic of conversation changed abruptly from police death squads to the national ramifications of a professional assassination carried out in the capital city of Tegucigalpa. The victim this time was the chief of the government’s anti-money laundering unit. An attorney with close ties to U.S. authorities, he was the primary author of Honduras’s 1997 anti-money laundering law. He was shot 7 times while driving home in a perfectly synchronized professional hit involving several accomplices working in coordination on foot, car and motorcycle. According to the United Nations 2011 Global Study on Homicide, the number of murders in Honduras have been rising steadily, and in fact doubled between 2005 and 2009 (from 35.1 murders per 100,000 to 70.7). This rate jumped another 16% in 2010 to 82.1, making Honduras the most dangerous country in the world in terms of homicides. The state of affairs have gotten so bad, that the Obama administration suspended its Honduran Peace Corps program early last year and evacuated all its volunteers. What’s even more troubling is that whereas the situation is getting worse in Honduras, it is improving in the neighboring countries of Guatemala and El Salvador (collectively referred to as the “Northern Triangle” region of Central America). According to the country’s largest public university which tracks all violent crime nationwide under a program known in English as the “Honduran Observatory on Violence”, the nation suffered 7,172 murders in 2012, an increase of 68 homicides over 2011. This is in sharp contrast to its Northern Triangle neighbors where both countries saw a decline in homicides. El Salvador tabulated a drop of 40%. Meanwhile, Guatemala is on track for a third year of fewer murders, a much welcome trend. Coincidentally, the Observatory announced that in 2012 San Pedro Sula suffered 159 murders per 100,000 residents. That ranks San Pedro above Ciudad Juarez, Mexico — which has topped the list for the past 3 years as the most violent city in the world. Although Mexico’s violence often makes the news in the U.S., the fact is that the murder rate in the Northern Triangle of Central America is far, far worse. The average homicide rate in the Northern Triangle is 63.1 per 100,000. This is 350% worse than Mexico’s 18.1. As allegations of police death squads working directly for the Chief of Police were circulating in the news, another high ranking government official was assassinated. Thus, I began to wonder whether there isn’t something much, much bigger going on in Honduras than mere petty gang-related turf wars. However, don’t get me wrong. There’s plenty of that supposed “petty” crime going around — but it’s not limited to the gang-controlled neighborhoods. Consider that just in the few weeks that I was there, I became aware of three crimes against persons whom I knew personally, or who were only 1 to 2 degrees separated. One was the kidnapping (and subsequent murder despite 2 ransom payments) of a well-known event planner’s spouse. Another was the “24-hour” kidnapping of a personal yoga instructor. In Honduras, these 24-hour kidnappings are known as “secuestros express” due to their typically small ransom demands, usually ranging from about the equivalent of US $1,000 to US $5,000 so that the ransoms can be paid within 24 hours. The third crime was a shooting rampage in a public bus that killed 1 and injured 3. The office manager of a dear friend of ours was one of the severely injured. Happily, she survived an emergency operation to remove a bullet lodged just 2 cm. above her thoracic region. She was recently released from the hospital and, as of the writing of this post, is still recovering at home. It was the person sitting right next to her who died (3 gunshots). The assailants are still at large. I’ve come to the conclusion that Honduras is practically at war for its very sovereignty (both at the highest levels of government as well as on the streets). And I believe few foreign investors are actually aware of what’s going on in this country; of who the warring factions are; and — if you are already doing business down there — of what your financial AND legal liabilities might be. (I will delve into these issues in part 3). What’s worse, I believe that in the foreseeable future, Honduras will continue to lose battle after battle in this war — leaving behind an ever rising number of victims without prejudice to their social status, gender, nationality, employment situation, age or neighborhood that they live in. Therefore, unless you are in the war business, think long and hard before putting your employees, managers, executives and/or capital at risk in Honduras. Part 3 — If you are an American doing business in Honduras, your risks are far more than just financial. There is this law called the Foreign Narcotics Kingpin Designation Act that makes it a crime for Americans to engage in “any transaction” with persons designated as drug kingpins. Penalties for violations of the Kingpin Act range up to $10 million and 30 years in jail…To be continued next month. Part 1 — The Sales Pitch… I recently accompanied a client to a sales and marketing presentation by a leading Business Process Outsourcing (BPO) provider in the United States extolling the benefits of outsourcing to San Pedro Sula, Honduras. The sales team talked about how this Central American city offers just about everything that a light manufacturer or outsourcer could want, and even more. Chief among them is the abundant supply, quality and stability of an inexpensive bilingual labor force. With over 400 bilingual schools and 7 universities, Honduras graduates thousands of English-speaking high school and university students every year — far more than all other Central American countries combined! Not only are they well educated, but their English is generally considered to be “accent neutral”, meaning that it cannot be recognized by the average American as being from any particular region of the world (as in the case with India or the Philippines). Tragically, the underemployment rate in Honduras is crushingly high (58% in 2012 according to the National Institute of Statistics or INE in the Spanish acronym), but this offers significant opportunities to potential employers. There’s a deep pool of inexpensive talent from which to choose, and once hired, most Hondurans hang on to their jobs for dear life. Job hopping is not very common, so attrition is quite low (under 20% by several accounts). Other advantages include a phenomenal information and communications technology (ICT) infrastructure with three fiber optic cable networks to ensure less than 80 milliseconds latency. In addition, San Pedro is only an hour’s drive from the largest and deepest seaport in Central America. In fact, Puerto Cortes is 1 of only 6 seaports in the world that have been certified under the U.S. government’s “Megaport Initiative” that scans for radiation and other risk factors prior to shipment. When combined with the presence of a local U.S. Customs and Border Protection office that inspects all containers prior to departure, it means that your cargo will unload much faster upon arrival in the U.S., avoiding your company the slow, time-consuming process of customs paperwork and inspections. Finally, San Pedro Sula is an economic powerhouse, producing two thirds of Honduras’ entire GDP. Business is the name of the game in San Pedro, and the local business community is highly professional, efficient and competitive — very important factors to consider for your supply chain. It’s no wonder then that these unique features have persuaded dozens of textile manufacturers over the last 20 years, and a half dozen BPO outsourcers in the last 18 months, to set up shop in San Pedro Sula — including the one whose presentation I alluded to at the beginning of this blog post. Maybe things have improved, I thought to myself. After all, I stopped following local events after the signing of the National Reconciliation Agreement of October 2009 that sort-of resolved the pseudo-military coup d’état and subsequent constitutional crisis that erupted earlier that year. But from what I knew just prior to the coup, I could not in good conscious recommend Honduras to my clients as a “safe” country to invest — notwithstanding my personal feelings. Part 2 — The Reality… 2012 was a Record Year for Murders in Honduras and they were not merely gang-related. Moreover, Honduras now ranks as the country with the highest number of murders per 100,000 residents in the world, and San Pedro Sula replaces Ciudad Juarez, Mexico as the most violent city… To be continued next month. This month marks the 1-year anniversary of the New York Times article by Pulitzer Prize winner David Barstow alleging a vast conspiracy of bribery and corruption in Mexico that dated back to 2002, when Walmart was aggressively expanding its footprint in that all-important emerging market. The Times claimed that it was only after learning of its investigation in November 2011 that Walmart “voluntarily” disclosed to the U.S. Justice Department that it had begun an internal investigation into possible violations of the Foreign Corrupt Practices Act (FCPA), which outlaws the bribery of foreign officials by American executives. All along, Walmart has claimed that none of their senior officers (including its current CEO Michael T. Duke) knew anything about any Mexican bribes. The Cummings/Waxman letter (a copy of which can be read here: http://waxman.house.gov/reps-cummings-and-waxman-release-documents-showing-wal-mart%E2%80%99s-ceo-was-informed-mexican-bribery), focuses on only 1 particular store. But the New York Times article from last year alleged a massive bribery scheme throughout the entire country. You can read the stunning article here (http://www.nytimes.com/2012/04/22/business/at-wal-mart-in-mexico-a-bribe-inquiry-silenced.html?ref=davidbarstow). Due to that New York Times report, Walmart is having to spend a lot of money on defending itself against multiple shareholder lawsuits and on the FCPA investigations. In its most recent Annual Report, which the company filed just last week with the Securities and Exchange Commission, the company disclosed that it spent $157 million during the fiscal year that ended January 31, 2013, and that it expected to incur an additional $45 million during the first quarter alone. Given the amount of money Walmart is spending on its legal defense, it’s hard to predict at this point whether any Walmart executive(s) will be going to jail. The investigations are ongoing, and no criminal indictments have been handed down to date. In addition to the alleged cover-up by Walmart executives in Arkansas, what troubles me is the sophistication of the supposed bribery scheme masterminded by the Mexican executives. If proven to be true, the scheme should serve as a huge wakeup call to any foreigner wanting to invest, or already doing business, in Latin America. You should assess your current operations there, and take concrete steps to protect yourself and your company from corruption risks in this region. According to The Times, in the ensuing internal investigation ordered by Ms. Munich, Mr. Cicero spent hours explaining the mechanics of how he had helped funnel bribes through trusted facilitators, known in Mexico as “gestores” (pronounced hes-TOR-ehs). Gestores are facilitators who help individuals and companies to get things done in Mexico, especially when dealing with slow-moving government agencies. They grease the wheels of progress and are a daily reality of Mexican culture. Although some are legitimate, many are not and it was Mr. Cicero’s job to recruit the latter. Operating in the shadows, Mr. Cicero recounted how he worked closely with them, sharing strategies on whom to bribe and for how much. He described how they targeted mayors and city council members, urban planners, bureaucrats who issued construction permits, and anyone who might get in the way of Walmart’s relentless quest for growth. The bribes, he said, bought zoning approvals, reductions in environmental impact fees and the allegiance of community leaders. Furthermore, they got zoning maps changed; they made environmental objections vanish; and they expedited permits that typically took months to process. According to The Times, Mr. Cicero further described how Walmart de Mexico perfected the art of fraudulent accounting. The gestores submitted invoices with brief, vaguely worded descriptions of their services, with secret codes written on the invoices. The invoices covered the bribe and the gestor’s fee, typically 6 percent of the bribe. The codes identified the specific “irregular act” performed. One code would indicate a bribe to speed up a permit; another would describe the elimination of a fine, etc. According to Mr. Cicero, the invoices with the secret codes were carefully monitored by a handful of Walmart de Mexico executives in the know, which included the board chairman, the CEO, the general counsel and the chief auditor, among others. Each month, they received a detailed schedule of all of the payments performed. 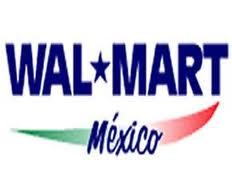 Walmart de Mexico then “purified” the bribes in accounting records as simple legal fees. All told, over $8 million dollars were paid in bribes. But wait, there’s more!! According to the New York Times, an internal probe by Bentonville investigators found that the corruption in Walmart’s largest foreign subsidiary might be far more extensive than even Mr. Cicero had described. In going through Walmart de Mexico’s database of payments, investigators found large “contributions” and “donations” directly to state, municipal and local governments all over Mexico — nearly $16 million in all since 2003 — in return for the licenses, zoning approvals and construction permits needed to build their stores. You might be thinking that this sounds more like the script for a Hollywood fictional thriller about corporate corruption, and not the dealings of a respected Fortune 500 company listed on the New York Stock Exchange. I thought so myself at first, until I started to wonder about the $200 million in legal fees that Walmart has shelled out to defend itself and its executives. You just don’t spend that kind of money unless there is some truth to the allegations! With over $100 Billion in worldwide sales per quarter, it would seem that Walmart can easily afford $200 million. Now ask yourself, as a foreigner doing business in Latin America, could you survive an investigation on alleged corrupt practices?